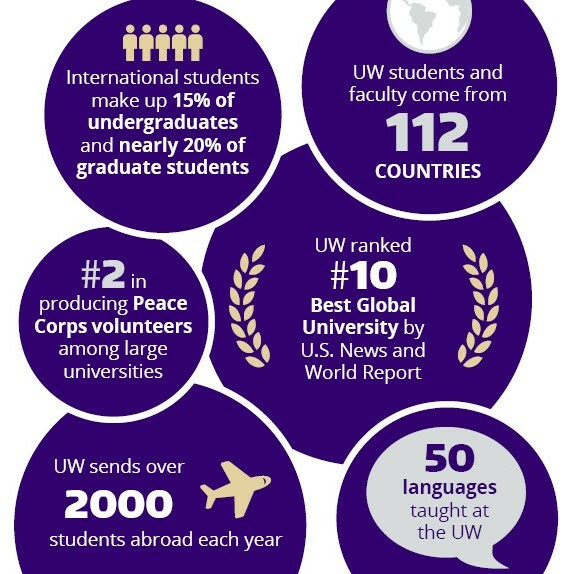 "International students, and students with international backgrounds, strengthen our UW community — from our classrooms and labs to our residence halls and student organizations. They bring diverse knowledge, perspectives and experiences. Through evolving existing programs, and creating new ones, we are intensifying our efforts to provide international students with a rich student experience — one that connects them to domestic students, and to each other, both in and out of class to build lasting, cross-cultural relationships with opportunities to share and learn." "...the Foundation for International Understanding through Students (FIUTS) hosts its own 10-day “Welcome Weeks” at the start of fall quarter for all incoming international and exchange students. Students explore campus and the greater Seattle area, and participate in dozens of activities. 'Whether here for a one-quarter exchange program or a seven-year PhD, undergrad and graduate students from all over the world take part in the experience together,' says FIUTS Director Era Schrepfer. Students of all backgrounds — including many domestic students who serve as event facilitators — forge lasting relationships through the intense, often memorable 10-day experience." "FIUTS keeps a full calendar of its activities throughout the year. They host up to 40 social events and activities per quarter, from Mount Rainier hikes to Theo Chocolate factory tours, from snow-shoeing to bubble tea and hot yoga nights. Every Wednesday and Thursday, community volunteers lead culturesharing English conversation groups on campus, which are open to all (not just UW students). The Wednesday Lunch program offers food and socializing to 150-250 people each month a mix of undergraduate and graduate students, international and domestic, alumni and community members. 'It’s so important for students to build a community here at UW,” says Schrepfer. “Whether that includes students from other countries, their home country, domestic students, community members — it’s about finding the smaller university within the larger university.'" You can read the full report or download it as a PDF here.